Student yearbooks from Wingate University are now available in the North Carolina College and University Yearbooks collection. The Union County school was established in 1896 by Baptist organizations in North and South Carolina to educate students of all ages. It served as a two-year college for many decades before beginning to grant bachelor’s degrees in 1979 and offering graduate programs in the 1990s. 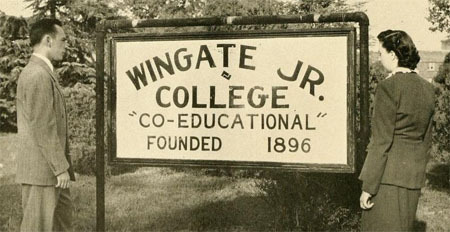 There are 72 yearbooks now online, beginning with the 1924 “Views of Wingate Junior College” and continuing through 2009. The original yearbooks are available in the Ethel K. Smith Library at Wingate.